Anne Irwin of Anne Irwin Fine Art Gallery has loved art since she was a child. Ann Richards is a portrait broker with Portraits Inc. who describes her job as a someone who tries to make everyone happy—both the artist and the client. At the Portrait Society of Atlanta’s January meeting, they came together to talk about “Developing an Art Career in Today’s Market,” answer audience questions, and review portfolios. For Anne Irwin, her gallery’s success is because of, and has grown out of, her passion for something she loves. She identifies as being something of an accidental businesswoman who started without even a business plan. As a gallery owner, she endeavors to educate the buyer and likes to represent artists that are passionate about being gallery artists. There are very few objects in this life that you can own and know that absolutely nobody else in the world does—fine art is one of those things she says. 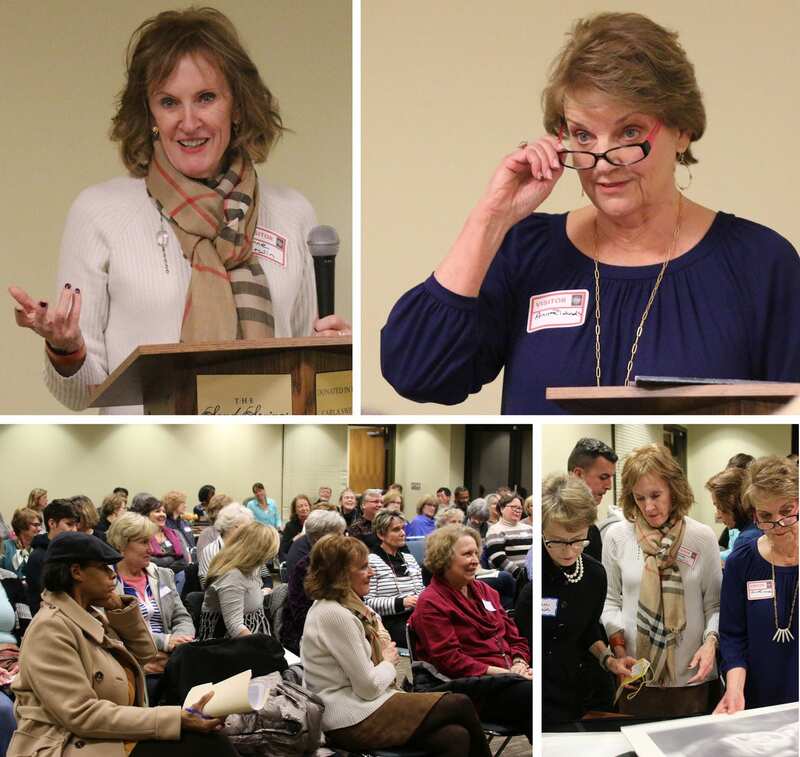 Top row; Anne Irwin (left) and Ann Richards (right) shared insights into today’s art market from the perspective of the art gallery owner and the artist’s representative. After their presentation, there was time for portfolio review and advice (lower, right). Irwin shared information on current trends in the gallery market. While abstract sales are taking the lead today, to Irwin the best abstract work is enigmatic, nuanced, and usually done by someone who understands the fundamentals of representational methods. For her to successfully market representational still life paintings today, the piece must have a twist, as standard run-of-the-mill still life setups aren’t moving. In representational landscapes, her clients show more interest in “looser” styles. Square canvases are popular and larger canvases are more in-demand than small works, which sell better around Christmas. In closing, she shared basic advice on how to query a gallery for representation. Do your homework first. Is the gallery a good fit for your style? If so, send a query letter, don’t walk-in with your portfolio and expect someone to have time to look at your work on the spot. Take time to personalize your query letter, or email, for the appropriate gallery contact. Ann Richards is a portrait broker with Portraits Inc., which represents about 150 artists, mostly in the U.S. but also in other countries. Richards states that they are always looking for the right artist to complement the current roster. She then detailed benefits a broker could provide an artist: 1) they work to promote you and get your name out there; 2) they offer experienced market-based advice on your portfolio; 3) they handle the contract, pricing, scheduling, delivery, travel and payment—everything except the painting; 4) they can coordinate unveilings; and 5) they offer continuous support—and are always just a phone call or email away. And, according to Richards, Portraits Inc. also hosts an annual conference and seminars for their artists. With 60 reps in 22 states, Portraits Inc. relies on digital portfolios to show the client a range of styles and narrow down what they’re actually looking for. Also, the broker must be a good listener—you can’t force a bad fit, says Richards. In selecting work for a portfolio, she emphasizes “quality over quantity”. Show your current work, subjects of varying ages, and these samples should be representative of the work you are selling today. Have a website and take advantage of social media platforms to promote yourself and create visibility, she advised. All good advice, and graciously shared, whether you’re independent or represented by a broker. Find out more about Anne Irwin Fine Art Gallery at anneirwinfineart.com, and about Ann Richards at portraitsinc.com.